Read the most frequently asked questions and find the answers you are looking for. You can find the list of frequently asked questions below. If you require any additional information, do not hesitate to contact us at: +32 (0)3 366 34 10. 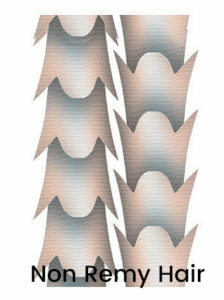 Remy hair means that the cuticle layers are all facing the same direction, from root to end, and therefor do not tangle. The hair is also virgin hair, which means it has never been chemically treated. Brands that do not use Remy quality, use very strong products to distroy the hair cuticles. Because of this treatment, the natural color, shie and texture are lost and the hair will frizz and tangle after several washes. We distribute the Euro So.Cap. label. These are the best pre-bonded keratin-based hair extensions, made from 100% human hair (natural hair) from India. This highly depends on your type of hair and personal preference. Based on our experience, we have seen that 25 to 50 pieces are enough to increase volume. To lengthen your hair, we recommend using at least 100 pieces of hair extensions depending on your current hair length and the desired hair length. On average, 150 pieces are needed for a perfect result. To apply 150 hair extensions using a hot iron, you should take 3.5 hours into account. A much faster approach is offered by the “cold fusion” ultrasonic system, drastically reducing the time needed to approximately 1.5 hours. How long do my hair extensions last? 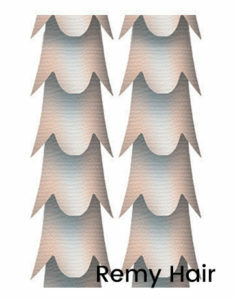 Since your hair will grow about 1cm per month, you can expect that your hair extensions will last up to 3 to 5 months. However, this is highly varies from person to person, depending on your hair length and structure, amongst others. It is evident that the post-extension hair care is also important. Consequently, a checkup after 6 to 8 weeks is recommended. Can I color or dye the hair extensions? We do not recommend that you dye, bleach of tint your hair extensions, since they have already been dyed and treated once before. If you still decide to colour the hair extensions, it is on your own risk. Can I brush my hair extensions? Of course you can! This is highly encouraged and should be done frequently. If you choose to lengthen your hair or to add volume, we advise you to use an extension brush designed for that purpose. Frequent brushing of the hair, will prevent your hair to become entangled. Can my hair extensions be re-used? Although possible, we advise against it. The extensions will need to be refitted with new keratin bonds which is a cumbersome and time-consuming task. Hence, it is cheaper to apply new hair extensions. In addition, your hair cut will be different from previously. As a result, we will always loose some length when re-styling your hair. Nevertheless, the following hair extensions can be re-used: “Sticker Extensions”, “Clip- On Free extensions” & “Flat Ring-On extensions”. Is it possible to go swimming with hair extensions? Swimming is allowed, but we advise to wear your hair in a braid. We would also advice to keep your head above the water or use a bathing cap. The level of salt (from the sea) on the one hand, and of the chlorine used in swimming pools on the other hand could damage the extensions. A shift in your hormone balance during pregnancy or after child birth, “may” lead to hair loss and consequently a shorter lifespan of the hair extensions. This happens when the root of the hair is weakened. In the worst case, the extra weight of the hair extensions may even result in pulling your own hair when brushing it. When taking medication, it is important to read the instructions leaflet whether the drug affects loss of hair. If this is the case, we advise against the use of hair extensions. Please make sure to mention this to your hairdresser. When hair extensions are applied professionally and well taken care off, hair extensions will not damage your natural hair. Hint: Always let a trained professional apply or remove your hair extensions. By using the Liquid Remover from Euro So.Cap. the keratin bonds are made porous. This allows the extensions to come off easier and to slide from your own hair. Your hairdresser will discuss your wishes with you. By using our extensive colour scheme & coloring samples, you will be able to find a good match. When a problem arises, we will look into the cause of the problem and will solve the issue if needed. For detailed warranty conditions, please click this link.